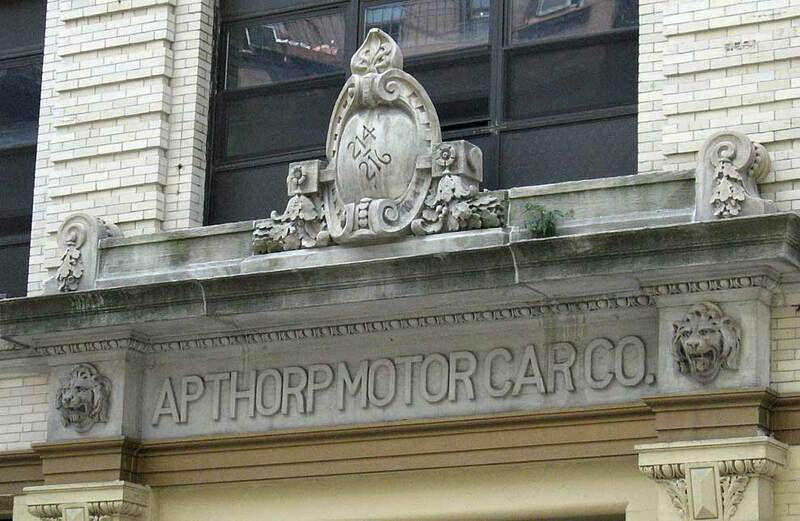 The original Apthorp Motor Car Co. seems to have been formed as a combination of an early parking garage and automobile dealership. The Building Permits Database at the Office for Metropolitan History provides the following information on 214-216 E. 80th St. (1906), "NB 1027-06; cost $45,000; 6-story brick and stone garage, 48 x 95 feet; owner: Palace Garage Co., Times Building; architect: C. B. Brun, 1 Madison Ave."
In 1908 the journal, Motor World, Vol. XIX, No. 2, New York, Thursday, 8 Oct. 1908, p. 52, reported, "New York City representation for the Kissel Kar has been arranged, the Apthorp Motor Car Co., 214 West Eighteenth [sic] street, having closed a contract with the Kissel Motor Car Co., of Hartford, Wis., to handle the latter company's three models in the metropolis and its vicinity. F. S. Dickinson is president of the Apthorp company, which was but recently organized." But the enterprise seems to have been short-lived. Less than a year later Motor Age, Vol. XV, No. 15, Chicago, 15 April 1909, p. 39, reported, "Kissel Changes - The Kisselkar's New York headquarters have been removed to 1875-77 Broadway. In changing its location, the name of the concern also changes from the Apthorp Motor Car Co. to the Kissel Motor Car Co., of New York." Directory listings for an Apthorp Motor Car Co. exist only for the years 1908 through 1911. The company was listed in the 1909 Year Book (Motor Cyclopaedia), published by Automobile Topics, Inc., 103 Park Avenue, New York, as follows, "Apthorp Motor Car Co.- 2230 Broadway; 214-216 W. 80th St., New York City. (Kissel Kar.) Est. Sept. 1, 1908. Cap. $50,000. F. S. Dickinson, Pres. and Treas. ; A. F. Dickson, Vice-Pres. ; E. F. Giverson [sic], Secy. Garage, 200 cars; repairing and supplies." The officers of the Apthorp Motor Car Co. were Frederick Simon Dickinson (1874-1938), Alexander F. Dickson (1859-1944), and Edward F. Giberson (1859-after 1933). All of these gentlemen seem to have left the garage and auto dealership business prior to 1910. Frederick Dickinson, for instance, appeared in the 1910 U. S. Census living at 324 W. 83rd St. and gave his occupation as "Sales Manager, Building Stone." Alexander Dickson lived at 130 W. 61st St. and identified himself as "Contractor, Buildings." And Edward Giberson lived in Tarrytown, Westchester County, and said that he was an executive at a stone quarry. When Frederick Dickinson died, he received a short obituary in the New York Times, 12 Oct. 1938, reading, "Frederick S. Dickinson, who had been active in the bicycle and tire industries, died suddenly on Sunday of a heart attack at his residence, 574 West End Avenue. Born in Chicago sixty-three years ago, he had lived here since 1895. In his youth he was well known as a bicycle rider. Surviving are his widow and two brothers, A. E. Dickinson of Chicago and Edward Dickinson of Bedford, Ind." Edward Giberson was mentioned in his wife's obituary, New York Times, 4 June 1934, "White Plains, June 3 - Mrs. Margaret Nebraska Giberson, formerly a prominent resident of Tarrytown, wife of Edward S. Giberson, died here this afternoon at 212 Church Street, where she and her husband have been living with her sister, Mrs. Irving N. Tompkins. ... Her husband had been president of William Bradley & Sons, Long Island City stone dealers." Meanwhile, as a parking garage the Apthorp Garage at 214-216 W. 80th St. had an extended history from 1908 through 1981. This ad for the Apthorp Motor Car Co. Garage dates from 1909. In the mid-1980s the name changed to the Dana Garage. In 2002 they were part of the Edison Park Fast chain, and more recently (2012), the Central Parking System. An early owner of the Apthorp Garage was Morris Segall (1874-1940), who was listed as president of the Apthorp Garage Co. in 1911. Morris Segall was an immigrant from Germany at the age of 10. He was the son of a confectioner, Wolf Segall, and lived with his family on Surf Ave., Brooklyn, at the time of the 1900 U. S. Census. His occupation was recorded as "manufacturer, picture frames." Morris Segall's obituary in the New York Times, 25 June 1940, read, "A funeral service was held yesterday for Morris Segall, West Side garage operator and assistant secretary of the Broadway Association, who died Friday at his home, 129 West Seventy-fifth Street, after a long illness. Mr. Segall was also organizer of the Metropolitan Garagemen's Board of Trade and of the West Side Neighborhood Improvement Committee. The service, which was conducted by the Rev. Edward L. Hunt, was held at the Central Funeral Parlor, 109 West Eighty-seventh Street. He leaves a widow, Mrs. Ella Segall." The architect of 214-216 W. 80th St. was Clement Benjamin Brun. He is credited with 15 filings on the Building Permits Database at the Office for Metropolitan History. Among these were two additional West Side garage buildings at 213 W. 82nd St. and 207-211 W. 98th St. Neither of these is currently (2012) extant. Brun's filings range in date from 1905 to 1916. In 1931 The Cornell Alumni News, Ithaca, N.Y., August, 1931, reported that he left the profession in 1923, "90 BS Arch - Clement B. Brun, after practicing architecture for some time, in 1923 became a doctor of chiropractic and has been following that profession in France. His address is 7, Rue de la Buffe, Nice." The name Apthorp is best known for the Apthorp Apartments at Broadway and 79th St. (Clinton & Russell, 1906-1908). This and several other New York City properties were named after Charles Ward Apthorp (1726-1797), a wealthy landowner on Manhattan's West Side in the 18th century. He was the son of Charles Apthorp (1698-1758), a British-born merchant in 18th century Boston, and he remained a loyalist during the American revolution. As a consequence, his property in Maine and Massachusetts was confiscated after the war, but somehow his New York holdings remained in his possession. The "Apthorp Mansion," built around 1765, was located approximately between 90th and 91st Sts. and Columbus and Amsterdam Aves., where it stood until 1892. This rendering of the Apthorp Mansion appeared in The Greatest Street in the World; the Story of Broadway, Old and New, from the Bowling Green to Albany, by Stephen Jenkins, 1911.